InSink Balls™ prevent odors and backups, and discourages fats, oils and grease in non-food sinks and hand-wash stations. Drain pucks prevent odors and backups, and discourages fats, oils and grease in smaller, non-food sinks and floor drains. Floor drain devices prevent odors and backups, and discourages fats, oils and grease in non-food sinks and large drains. Grease patrol prevent odors and backups, and discourages fats, oils and grease buildup in non-food preparation sinks, floor drains, and on non-food surfaces. 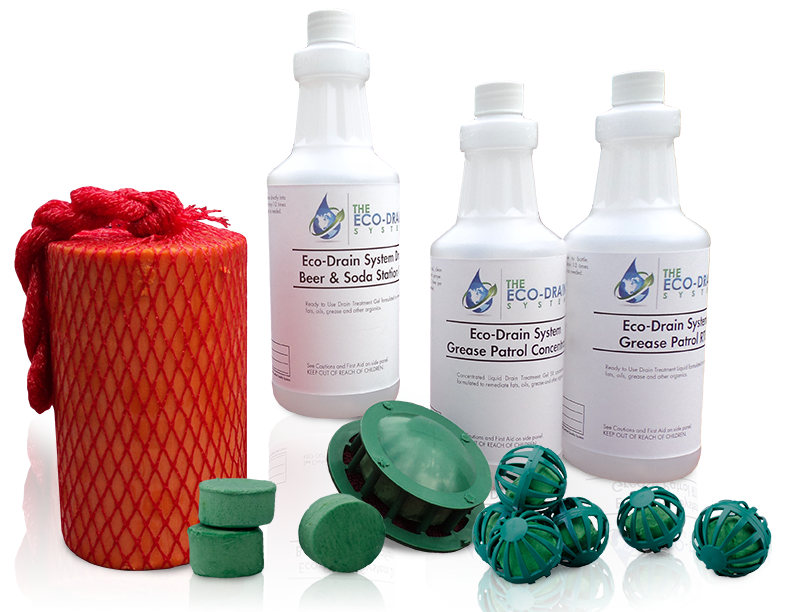 The Eco-Drain System is a collection of 100% natural products that remediates fats, oil, and grease (FOG) buildup where it starts: in the drains of sinks, floors and beverage trays. Unlike harmful chemical-based competitors that can be ineffective and only mask unpleasant fruit fly attracting odors, the proprietary natural bacteria compound of The Eco-Drain System breaks down drain-clogging FOG, transforming it into earth-friendly water and carbon dioxide. The result is clear drains, management over FOG and all organic matter, and the delicious smell of today’s special in the air.